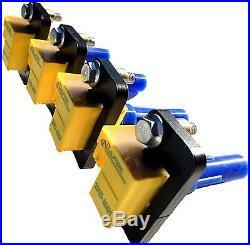 (4) NEW FOUR HIGH PERFORMANCE COIL PACKS / COMPLETE SET. FULL COIL SYSTEM SERVICE / JDM Subaru IMPREZA Saloon WRX and STI. & FITS USA / Canadian & other MARKET SUBARU IMPREZA WRX. 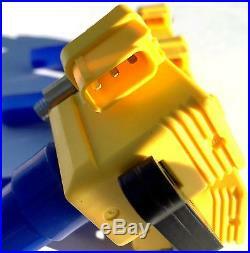 NEW IGNITION COIL FOR SUBARU IMPREZA WRX 2.0L H4 EJ205 TURBO UF480. 2001+ (all JDM) including Forester Cross Sports and STI. JDM EJ205 EJ207 EJ206 EJ20TT 2.0L LEGACY / WRX WAGON & STI Turbo engine. This part is compatible with: 5C1398, E960, 52-1749, IC560, UF-480, 22433-AA421, 22433-AA560, 22433-AA561. 2002, 2003, 2004, 2005 USDM 2.0L USDM MODEL SUBARU IMPREZA WRX TURBO 2.0L EJ205. 9901 (JDM Wagon Body only). Forester Cross Sports, S/tb, STI. Known by the following part numbers. 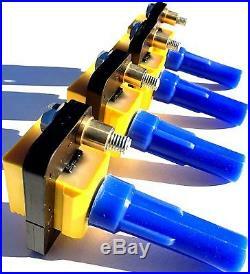 THIS IS A SET OF (4) FOUR COILS / DIRECT BOLT IN REPLACING FOR OEM SUBARU / DIAMOND. Improved throttle response and smoothness. Eliminate engine misfires and hesitation. No spark blowout at higher boost. Direct Bolt in part / No modifications required. MEETS OR EXCEED OEM PERFORMANCE. Brand New Coils / Igniter Packs / In New Packaging & Box. 2 Years on all products for replacement. We will not be responsible for loss of use, personal injury, or any incidental or consequential damage to an engine / vehicle, or otherwise caused, or purported to be caused, by any product. All warranties cover parts only. Labor to replace a component is not covered. Also not covered is any damage caused through improper operation or installation. The purchaser agrees that any legal action must be brought in the county of Canada, Province of British Columbia. Napol Performance Parts Napol Performance Is a Canadian based Company Specializing in Performance Coil Pack Development. We Have a wide range of Import and Domestic High performance coil systems. Every month we are expanding into new product ranges. The item "SUBARU IMPREZA WRX 02-05 IGNITION COIL PACKS / LEGACY B4 BE5 BH5 EJ20 22433AA421" is in sale since Monday, December 07, 2015. This item is in the category "eBay Motors\Parts & Accessories\Car & Truck Parts\Ignition Systems\Coils, Modules & Pick-Ups". The seller is "napolproducts" and is located in Campbell River, British Columbia. This item can be shipped worldwide.